In honor of Tim Duncan Day, The Undefeated salutes the career of quite simply the most accomplished power forward in NBA history. Beyond his prodigious numbers and beyond becoming the main reason why a small market in South Texas was able to spread five championships over 15 seasons, Duncan became the league standard for longevity, loyalty and sustained success. In this appreciation by senior writer Mike Wise, who covered much of Duncan’s career going back to his rookie season in 1997, the Big Fundamental is truly Undefeated. Imagine being a classical clarinet virtuoso and finding out that everybody else auditioning for a job was hoping to tour with Parliament-Funkadelic. That was Tim Duncan, who came out of college in 1997 just as Allen Iverson, Latrell Sprewell, Stephon Marbury and a host of other NBA players were on the cusp of becoming counterculture heroes in mainstream America. He wasn’t a product of the Adidas or Nike camp system, those cattle calls where college and pro scouts salivate over 15-year-old hoop phenoms. No one told him how special he was until he had spent four years in college, at Wake Forest University, which almost no one did anymore. Duncan played the game that time forgot. He had New York Knick Bill Bradley’s elbow jumper and Boston Celtic Sam Jones’ understanding of trajectories and angles when it came to using the glass. He had Celtic Bill Russell’s incredible economy of movement – knowing when to rest, when to explode, exactly how many steps he had to slide over to rotate to someone else’s man. And, yes, he possessed the fundamentals of a certain hick from French Lick. But only one nickname felt right for Duncan, O’Neal said. 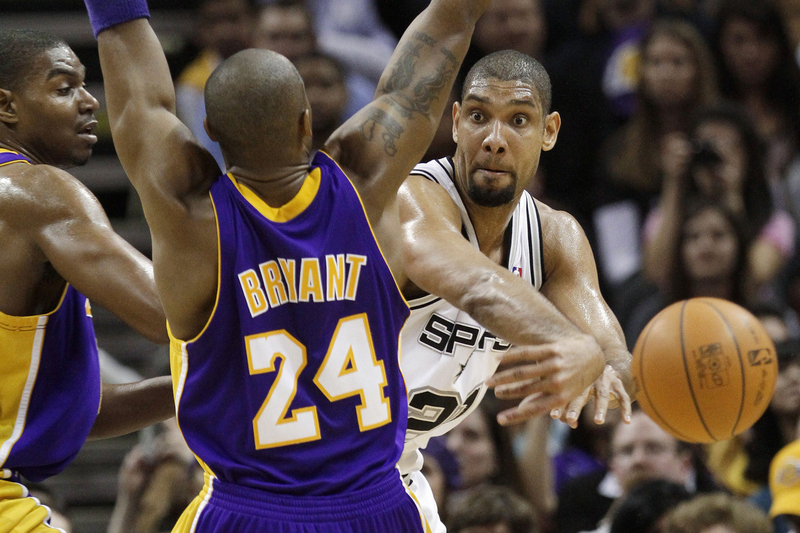 “I called him The Big Fundamental because his fundamental skills were perfect,” O’Neal said. “I put him in the same category as Larry Bird. Larry Bird didn’t run fast or jump high, but he’d eat you alive with his fundamentals. That’s what Tim did. San Antonio Spurs’ Tim Duncan, right, passes the ball around Los Angeles Lakers’ Kobe Bryant (24) and Andrew Bynum during the third quarter of an NBA basketball game Tuesday, Jan. 12, 2010, in San Antonio. San Antonio won 105-85. “He’s funny, interesting, opinionated,” Bowen said Monday from his summer basketball camp in his hometown of Fresno, California. “But he wasn’t going to put on a show if he didn’t know you. Retired Los Angeles Laker Kobe Bryant will always be seen as the most pivotal player in the transition from greats Michael Jordan to LeBron James. But no one from Duncan’s generation will equal his sustained success, winning his first championship in 1999 and his last just two years ago at the age of 38. When the Spurs won their fifth title in 2014 in what would become James’ last hurrah for the Miami Heat, Duncan became the only player to start for an NBA championship team in three separate decades. Duncan altered everyone’s career in the NBA. No player in league annals has recorded more double-digit scoring and rebounding games in postseason history and only Kareem Abdul-Jabbar had a longer stretch between titles for a perennial All-Star than the seven years Duncan persevered between 2007 and 2014. Mentally and physically, he was deceptively tough. Every bit of credibility earned came from his excellence over time. Nineteen years, 19 playoff appearances. How many times had the Spurs been written off with Old Man Riverwalk trudging up the floor like an octogenarian at a Saturday Y game? How many times did Duncan defy what you thought about him and his ability to be so good for so long? “That’s what I’ll always remember about him – he just kept coming back, no matter what,” O’Neal said. “I really think about it, he was a cross between Bird and Hakeem [Olajuwon]. “Hakeem, you couldn’t break ’em. You could ‘bow him, talk s—, you could play rough, he would just come back and give you his best. Tim was the same way. It didn’t matter what I said. What I did. You could never get to him. I would give him 30 one night and he would come back the next night and give me 30.